The majority of foreign companies are not making any profit or losing money in their partnerships with PDVSA to develop and produce hydrocarbons due to inadequate investment, shattered infrastructure and US sanctions. 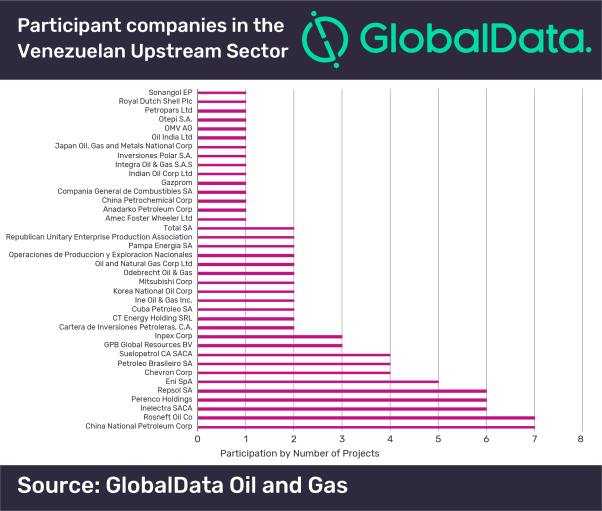 However, in the long term, having access to the vast hydrocarbon reserves of Venezuela compensates the current country risks and current negative cash flows in joint ventures (JVs), says GlobalData, a leading data and analytics company. In this way, foreign companies have formally or informally also gained operatorship in key upstream fields located mainly in the Orinoco Belt. Indeed, Rosneft gained operatorship in the Mejillones and Patao blocks and exporting rights for 30 years with an in-kind 20% royalty rate. Chinese and Russian companies have invested the most in the Venezuelan oil and gas sector during recent years. China, through its Development Bank, has provided more than US$60bn in loans to Venezuela. In 2018, it has given an additional US$5bn loan to support oil developments in the country, on top of the US$6.3bn in loans since 2014 from Rosneft.